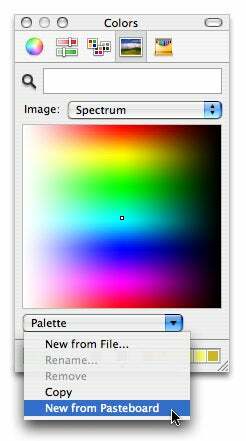 Back in September, I wrote about the secrets of the Color Picker, that small dialog box through which you set colors in many OS X applications. In that article, I discussed the various ways of getting the most out of the picker, including saving often-used colors, and working with other palettes. However, I overlooked one very cool feature—you can actually import your own images to use as the basis for your color palette. You can use either a saved image from your disk, or a graphic from your clipboard. Here’s how. If you use the File option, you’ll get the standard OS X file open dialog box; just navigate to the image you want to use and select it. If you use the Pasteboard option, you’ll see your custom image as soon as you choose the menu option. Either way, once your image is visible, click the Palette pop-up again and choose Rename to assign a more-fitting name; Fall Colors, perhaps, for my example. Once you’ve got the image in place, you can use it as your base palette for any future projects—this makes it easy to keep a consistent set of colors between projects, for instance. There’s one minor thing that you should be aware of, especially if you use a lot of custom images—the color picker seems to greatly increase the on-disk size of whatever image you use. You can see this for yourself—install a custom image, and then switch to the Finder. 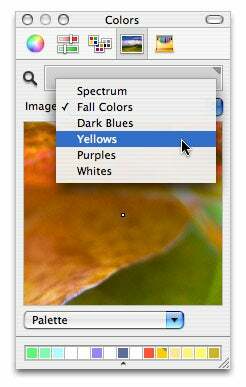 Navigate to your user folder/Library/Colors folder, and you should see your newly-added color file. (OS X makes a copy of whatever image you selected.) In the case of the Fall Colors image, a tiny little screen clipping became a 392KB TIFF image on the disk. In another experiment, I used an entire 550KB JPEG photo, and it turned into a 4MB TIFF. Though you won’t likely run out of disk space due to these copied and size-increased images, you may wish to keep an eye on the number of such images you use, just in case.